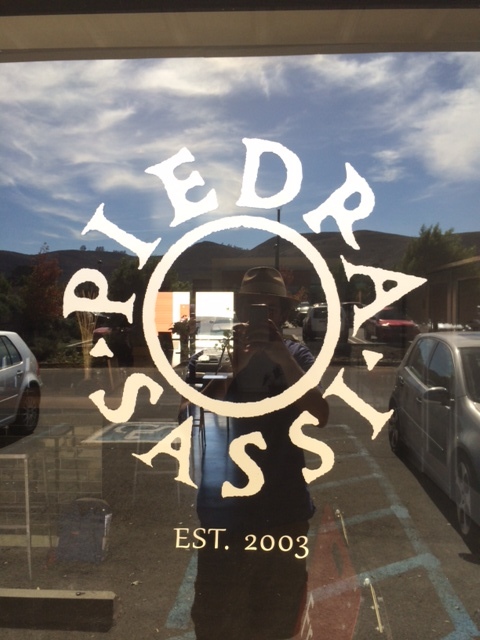 My love for the Central Coast’s Piedrasassi Winery is well documented. I won’t go too deeply into it here except to say that Piedrasassi is doing pretty much everything that produces the style of Syrah I like. They’re committed to cool climate Syrah and the wines are usually under 14% alcohol and aged in large neutral oak barrels with some stem inclusion. I stopped by the other day to talk with Melissa Sorongon, a partner in the winery with her winemaking husband Sashi Moorman, to check in on their 2012 releases. The following are my initial notes on their four upper end Syrah releases. I’ll post more extensive notes on each of the wines down the road after they get some time in bottle and I crack them individually. Piedrasassi’s least expensive of their upper-end Syrahs is a blend of three vineyards. 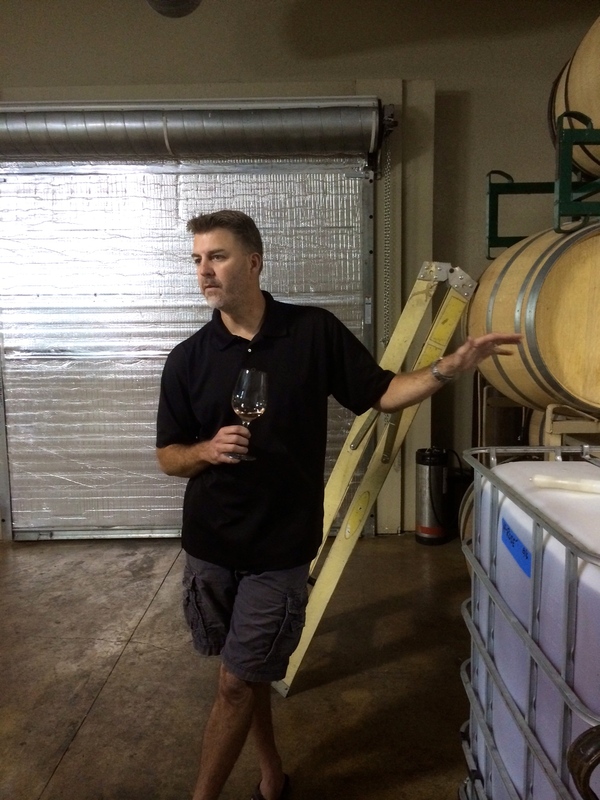 Moorman went into his Syrah project with the idea that he would be mostly blending from different vineyards to make the perfect blended Syrah. Yet, as the project has developed, Melissa and Sashi began to see that some of the vineyards that they were sourcing had such expressive individual signatures that they just had to have their own vineyard designations. The Piedrasassi Syrah at 13.5% alcohol is a blend from three vineyards, Presqu’ile, Harrison Clarke and Sebastiano. There’s still a bit of green character (not a bad thing in my opinion) on this wine at the moment, probably due to the stem inclusion. There’s a full mid-palate on this wine though, nice blackberry and plum and a brambly quality. Although it’s a full wine it has an elegance too. It’s a nice cool-climate Syrah but with a tad of California richness. The Santa Maria Valley Presqu’ile Syrah is a tad higher in alcohol at 14% and has an energetic lift to the mid-palate with savory tannins and a beautiful elegance on the finish. The Santa Ynez wine is from the Sebastiano vineyard. It’s bright and chalky with sweet plum aromas and sweeter tannins on the finish. Again, the mid-palate has a wonderful lively texture to it. The Rim Rock Vineyard Arroyo Grande Syrah is more of a floral Syrah with a Cote Rotie elegance and a bit of Cornas heft. It’s a generous Syrah but tightly wound with a nice bright finish. I asked Melissa why the wines, even though they are from individual vineyards, were named after the larger appellation from which they come. Melissa said that this was a conscious decision to bring more attention to the larger areas of Santa Barbara County rather than individual vineyards. She likened it to the story of the Bien Nacido vineyard which has become world famous but few people know that it comes from Santa Maria. Sashi and Melissa want people to know about Santa Maria as a whole, not just the vineyard sites. All of these wines are elegant and bright and could last for many years. I have all three bottles in my “wine cellar” and I’ll be opening them in the next couple of years to give more attention to each wine in separate, later posts. Can you #keepsyrahweird in Lodi? When one thinks of the hip winemakers of CA, the image of Ryan Sherman doesn’t automatically come to mind. To be clear, Ryan is no Matthew Rorick or Abe Schoener, he has no visible tattoos or scarves but Ryan is doing some hip stuff. His label, Fields Family Wines, where he works with owner Russ Fields, is making Syrah in a Zinfandel-centric appellation and it’s damn good. Ryan showing off the 2014 Rosé (which is also really crisp and delicious by the way). Centered in the Mokelumne River Valley, in the deep sand and somewhat cooler climate, Fields Family Wines is a small estate that’s mostly planted to Syrah. Originally, winery owner Russ Fields wanted to pull out the Syrah grapes and plant Zinfandel, but Ryan, who had developed a love for Syrah at wine dinners in his early profession as a pharmaceutical rep, made it his goal to convince Russ that good Syrah could be made from the grapes. Russ is now convinced. The tasting line up for the Lodi trip. Below are notes for the 2012 Syrah. The 2013 was still in barrel. There’s a pleasant funkiness and interest to this wine that belies its warm climate roots. It’s also surprisingly fresh on the palate with a bright finish and a mouth-filling texture. Zero oak is coming through on the nose and it has a pretty floral aroma mixed with salty plum and ripe blackberry. This is Syrah as it should be. It’s not a cool-climate area but Ryan is achieving cool-climate character with this wine. Ryan thinks a low frequency in racking helps preserve a freshness in the wines. He also picks earlier than his counterparts and uses very little new oak. He’s moving towards using even larger puncheons to minimize the wine’s exposure to oak for future vintages. Ryan’s experimenting with these big oak puncheons or foudres. 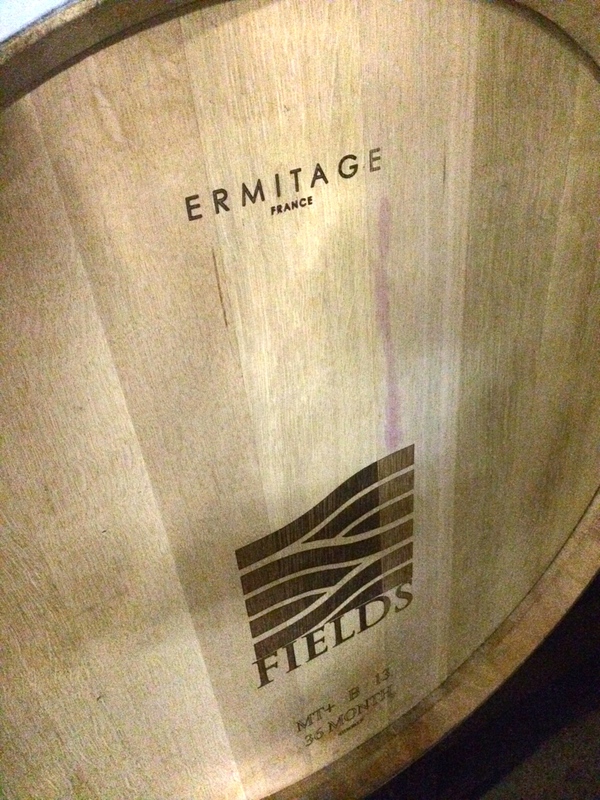 On my recent visit, I got to try the 2013 in barrel and I’m excited by the elegance and floral quality of that Syrah. Keep your eye out for some whole cluster Syrah from Ryan in the future and he’s even got an orange wine that I didn’t get a chance to try. 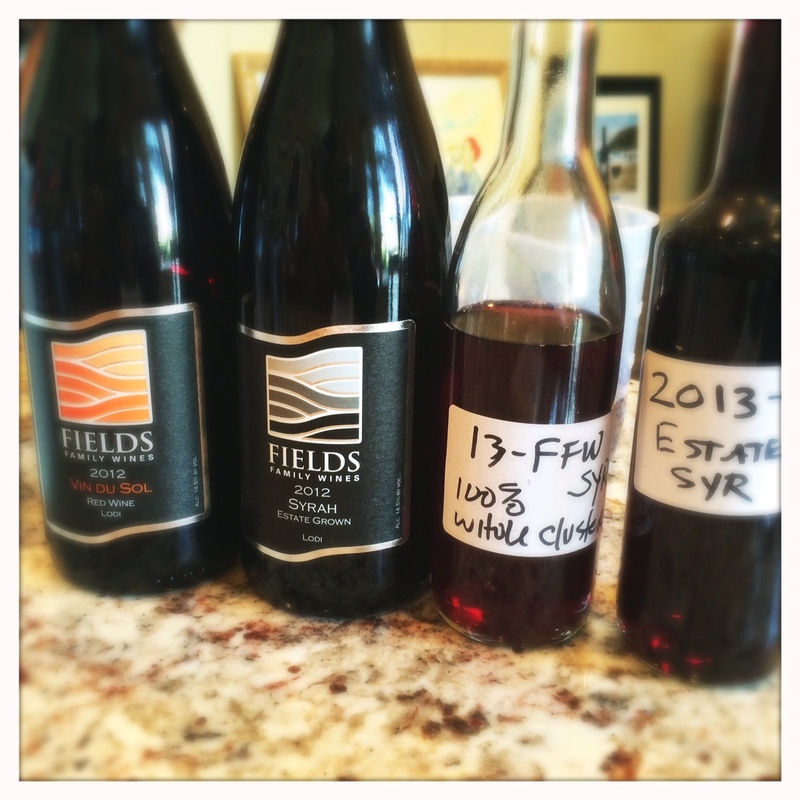 Fields Family Wines are still in their early days and Ryan’s open mind and willingness to experiment only bodes well for the future. This is definitely a winery to watch for me. Who knows, given these wines, we might be seeing Ryan dressing like Abe in a cravat soon?